The Supreme Court Janus decision is a devastating defeat for labor. Public-sector unions now have two choices: continued decline, or a reversion to the kind of militant collective action of the movement’s early years. Labor’s day of reckoning has finally arrived. In a landmark 5-4 decision in Janus v. American Federation State, County, and Municipal Employees, the Supreme Court has effectively imposed a “right-to-work” regime on public sector unions in all fifty states. There’s no sugarcoating it: this is a major defeat for an already embattled labor movement, and the successful culmination of years of right-wing judicial activism aimed at undermining organized labor’s last remaining stronghold. The decision punctuates a relentlessly brutal period for organized labor in the US. Six states have passed right-to-work laws since 2012, bringing the open shop to a majority of states including traditional union strongholds like Wisconsin, Michigan, Indiana, and West Virginia. Wisconsin enacted the infamous Act 10, which goes beyond the open shop to radically restrict the scope of collective bargaining and undercut public employees’ wages. Iowa and Missouri passed laws that require public sector unions to hold regular recertification votes, and a handful of states enacted so-called “paycheck protection” laws that require unions to obtain authorization from each member every year before deducting dues or fees from their paychecks. The Janus ruling only paves the way for another round of judicial and legislative assaults on the labor movement. With national open shop the law of the land in the public sector, it seems like only a matter of time before it crosses over to the private sector, either through congressional legislation or another Supreme Court case. This in turn would threaten the principle of exclusive representation, whose constitutionality right-wing legal outfits have already begun to probe in the lower courts. Non-traditional forms of labor organizing like worker centers and a raft of effective organizing tactics could very well come in the crosshairs. Barring a dramatic reversal in labor’s political fortunes, workers and unions could soon find themselves with fewer legal rights to organize and act collectively than they’ve had in a century. There’s no doubt that the immediate outlook for labor in the public sector and in general is fairly bleak. Still, as the tens of thousands of striking teachers have shown us there is no reason to succumb to fatalism or despair. Janus and its ilk don’t have to be a death sentence for what’s left of the labor movement. But the worst can be avoided only if we recognize the polarization of options before us: doubling down on business as usual, or a fundamental rethinking of the structures and strategies of the last four decades. The legislative-judicial onslaught against public employee unions should be seen as one component of a broader assault on the public sector itself. Politicians in both parties took advantage of the Great Recession to institute a harsh austerity regime that slashed public budgets and payrolls, and which continues to take its toll years after the crisis officially ended. Overall government employment is down sharply from the all-time high it reached in May 2010. The number of public employees dropped every year from 2010-2014, the first time this happened since the beginning of the Bureau of Labor Statistics (BLS) dataset in 1939. Government employers have since resumed hiring, but at far lower rates than before the recession. There are currently 670,000 fewer public employees than there were in 2010, with most of the job losses taking place after the official end of the recession in 2009. Absolute numbers don’t tell the main story, however. To get a clearer sense of the attack on public employment, we need to look at the share of public employment in total employment. As of today that share is barely 15 percent, a sharp drop from the roughly 17.5 percent share it reached in mid-2010, not to mention the all-time high of over 19 percent reached in 1975. You have to go all the way back to 1960 to find a share that low. While the time of outright job cuts seems to have passed, government employers are simply not replacing teachers, librarians, firefighters, transit workers, and police officers when they quit or retire. The co-workers they leave behind are forced to “do more with less,” the reigning management mantra for this era of austerity in public administration. The austerity drive has utterly decimated public education systems around the country. States and localities made deep cuts to school funding when the recession began in 2008, and while the worst of the cuts are behind us, many school systems have yet to fully recover. State funding for public schools plummeted when the crisis hit, and the deep tax cuts Republicans passed after sweeping state elections in 2010 mean that school workers continue to struggle with exploding class sizes, tattered books, and decrepit facilities. According to the Center for Budget and Policy Priorities (CBPP), twenty-nine states provided less overall funding for public schools in 2015 (the most recent year for which data is available) than they did before the crash of 2008. Seventeen of those twenty-nine cut funding by 10 percent or more — including Florida and Arizona, where combined state and local funding per student went down by a staggering 25 percent. The federal government under both Obama and Trump cut support for school aid, and the odious Betsy DeVos is seeking even deeper cuts in her drive to expand government support for private and religious schools. The impact on public employees has been truly devastating. From 2008 to 2017 the overall number of K-12 education jobs fell as student enrollment continued to climb. By the fall of 2017, there were still 135,000 fewer workers in public education than before the recession, while student enrollment increased by almost 1.5 million. Membership in the National Education Association (NEA), the country’s largest public education union, dropped by almost 230,000 in the same period, and other unions with significant concentrations in the public schools like AFSCME saw their numbers start to dwindle as well. The Janus decision ensures that those numbers will continue to drop in the coming months, as major unions slash budgets and project sharp membership declines. Considering the scale of these attacks, public-sector unions have generally been anemic in their response. Whatever militant resistance we’ve seen has been driven mainly by local unions and unofficial rank-and-file networks, not the upper layers of union leadership. This was the dynamic behind the Act 10 protests in Madison, where an unofficial walkout by University of Wisconsin teaching assistants sparked a six-week occupation of the state capitol, as well as the recent wave of strikes and protests in public education. With the very future of their organizations at stake, why haven’t union leaders been more aggressive in defending them? An illuminating New York Times profile of Lee Saunders, the president of AFSCME, provides us with a good starting point for answering that question. It paints a picture of a consummate Washington insider, “an institutionalist, at ease working within the system.” While professing a commitment to progressive politics and social justice, Saunders insists on pursuing those goals “through a strategy I feel most comfortable with. And that’s walking with crowds, but it’s also talking with very, very important people.” The rest of the piece makes clear that his emphasis is on the VIPs, not the crowds. This strategy may have been effective in maintaining public sector unions in an earlier period, when the fruits of economic growth were more broadly shared and unionization in the private sector was much higher than it is today. The influence union leaders gained within the Democratic Party apparatus, not just at the state and the local levels but in national politics as well, allowed them to protect the status quo that was established by the Supreme Court’s decision to recognize the constitutionality of agency shops in 1977. But in a world where working-class organization has been effectively eradicated in the private sector, the old repertoire of electioneering, lobbying, and closed-door negotiations has lost its effectiveness. Many labor leaders surely know this, but so far they’ve been unwilling or unable to reconstruct union organizations that were built to operate in a very different political period. Why? The Marxist sociologists Claus Offe and Helmut Wiesenthal anticipated these difficulties in their seminal 1980 essay “The Two Logics of Collective Action,” where they developed a “sociological theory of opportunism.” For Offe and Wiesenthal, opportunism in working class organizations is not fundamentally caused by moral failings among union leaders, the selfish interests of a labor aristocracy, or the so-called iron law of oligarchy. In their view, opportunism is a “rational but unstable” solution to the basic problems of working class organization, above all the simple fact that as a subordinate social group, workers face the extremely difficult task of challenging existing power relations instead of maintaining them. Offe and Wiesenthal advance a five-stage schema that charts the development of labor organizations over time. In stage one, unions are defined by a strong sense of group identity and depend almost exclusively on the members’ willingness to engage in collective action. This corresponds to what former AFSCME president Jerry Wurf described as the “voluntary and experimental” phase of public sector unionism, when workers built their organizations through strikes and other actions that were very often illegal. As their power grew, union success came to rely less on the members’ willingness to act and more on their potential to do so, not least because disruptive actions like strikes might jeopardize hard-won organizational gains (the consolidation of which constitutes stage two). This is, of course, an unstable and contradictory situation. The members’ willingness to act must often be curbed, but the maintenance of a credible disruptive threat relies on its periodic mobilization. At this point, the organization comes under strong pressure to transform itself to make its continued growth and development as independent of the members’ collective action as possible. And the only way of doing so, Offe and Wiesenthal argue, “is to substitute external guarantees of survival for those internal ones for which the union organization depends upon its members.” This is stage three, which the unions entered when they won the agency shop and other security guarantees in the wake of the unprecedented national public employee strike wave of the 1960s and 1970s. Union security was the precondition for “responsible unionism” in the public sector, which promoted routinized collective bargaining, the grievance procedure, and other mechanisms to ensure stability for the unions and employers alike. It also made the unions highly dependent on the good graces of Democratic Party politicians. This arrangement is obviously problematic from a democratic socialist point of view, predicated as it is upon rank-and-file demobilization and the development of a relatively autonomous leadership caste inside the unions. But so long as the broader political conditions were relatively favorable, it delivered real material gains for unionized public employees and the groups that are disproportionately represented in their ranks, namely women and people of color. While public employees are still underpaid relative to their counterparts in the private sector, mass unionization raised the wages, benefits, and social status of teachers, sanitation workers, health care providers, and other public servants who have been alternately viewed as self-sacrificing martyrs and incompetent time-servers. But when unions are able to substitute external guarantees for their own members’ willingness to act, they become extremely vulnerable to attacks on those guarantees when the political situation changes (stage four). Barring the effective neutralization of capital’s structural power over state policy, the day of reckoning is bound to arrive sooner or later. That day has arrived for public-sector unions, and now they’re confronted with stage five of the Offe-Wiesenthal schema: continued organizational decline, or a reversion to the kind of collective action that defined the movement’s formative period. This is not, of course, a simple yes or no proposition for union leaders. Some may not have an interest in reshaping their organizations to meet the new challenges; others may not know how to do so even if they want to. Decades of “responsible unionism” have atrophied the muscles of collective action, and many unions lack the capacity to organize their members in the workplace or turn them out to strike. The union’s main defense in Janus was that outside of direct spending on candidates and lobbying, its activities are fundamentally not political. But any renewal of the public sector labor movement depends on the thorough politicization of all aspects of union life, and its transformation into the leading force for the defense, expansion, and democratization of the public sector itself. What might that look like in practice? The militant early history of public employee unionism gives us a good deal of inspiration to draw on. In the winter of 1965, an independent radical union called the Social Service Employees Union (SSEU) waged an illegal strike that shut down New York City’s Welfare Department for a month. 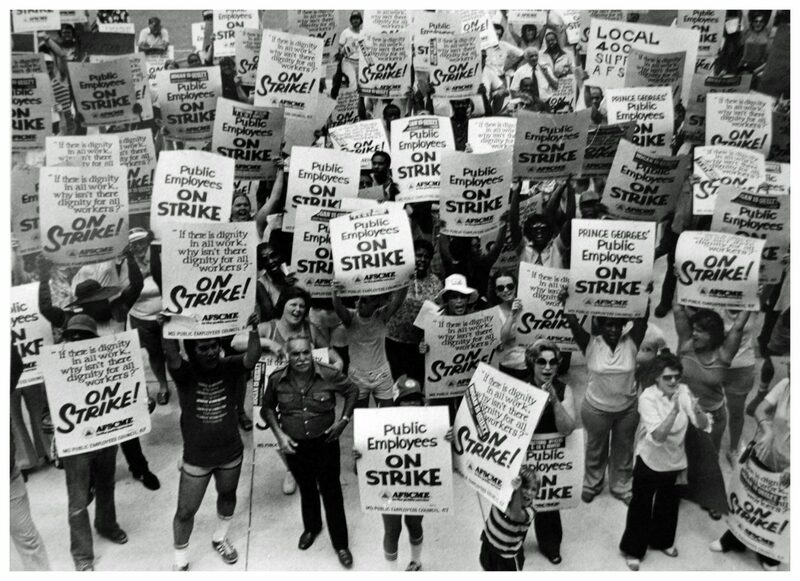 Despite their weaknesses and vulnerabilities, the strikers won a number of major victories that ultimately lead to the creation of New York’s modern system of collective bargaining. widespread democratic decision making and a commitment to participation by members, be they young or old. Not only had members voted to go on strike, a process required in most union constitutions, but SSEU members had been involved in the bargaining process from the beginning, writing the union’s demands, voting on the union’s response to Mayor Wagner’s ‘concession,’ and finally, planning the strike itself. Until its reabsorption into AFSCME’s District Council 37 in 1969, SSEU consistently fought to put the level and quality of public services on the bargaining table and to forge political alliances with welfare recipients — not least because of the sizable presence of socialists and New Leftists in its ranks. This is the tradition of militant, democratic public-sector unionism that was all too often forgotten during the union security era. It desperately needs to be resuscitated today. The recent wave of education strikes — particularly the remarkable West Virginia wildcat that kicked it all off — hearken back to that tradition and raise the possibility of its revival in our own time. The kinds of local leaders and unofficial rank-and-file networks that initiated these struggles and highlighted their broader political ramifications have shown themselves to be labor’s best hope. As they consider the post-Janus world before them, the rising generation of young radicals should do everything they can to join and support them.